The roots of Cockeyed Creations go back many years, to an offhand purchase at the Clignancourt flea market north of Paris. There multimedia designer Jim Gasperini fell in love with and purchased an elegant antique table-top stereo card viewer. 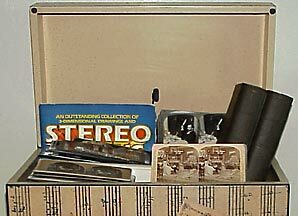 Stereo photography was an everyday pastime and common educational tool throughout the late 19th century and early 20th. Most middle-class families in America and Europe had a parlor viewer, though the elegant French model pictured at left was top of the line. More common were hand-held viewers like the one to the right. Having purchased a viewer, Gasperini needed something to view. Charmed by the uncanny sense of "presence" in vanished worlds, he went on to collect well over a thousand antique views in flea markets, antique shops and photography shows. As a collector he specialized in humorous situations, bygone industrial processes, and items of sociologic interest. Until the arrival of the motion picture, the stereo view was the most technically sophisticated visual medium available. Stereo views printed on "Holmes cards" were sold by the millions. Salesmen sold boxed sets door to door. Sunday school students passed around viewers showing images of the Holy Land, and sets designed as tours of faraway lands saw extensive use in classrooms. Though he lost his first Realist to the Colorado River when his raft flipped on the 10th day, the results from film shot before that (safely stored in a dry bag) ignited a new artistic obsession. Fast forward more than a decade, to the spring of 2001. Invited to join a private 18-day rafting trip down the Grand Canyon, Gasperini realized that the batteries for his digital camera would not last the trip. Coming across an old Stereo Realist camera from the 1950's, it occurred to him for the first time that he could make his own stereo photographs, and took it along. Animated .gif, one of Gasperini's first experiments with "time for space wiggle"
In 2003 he began exhibiting fine-art versions of his images as Stereojet prints, and experimented with web presentation using a technique he dubbed time for space wiggle, at first using animated .gifs but soon switching to Flash. How to create time-for-space wiggle is explained in an article for the OCC newsletter Panoram. 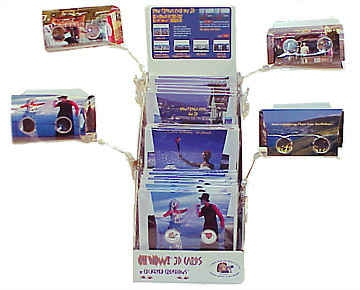 Also in 2003 began the greeting card project that would see fruition in 2004 as Cockeyed Creations. Our cards are entirely created in the USA. Pre-press and printing occur in San Francisco, lenses are made in Missouri, die-cutting happens in Santa Clara, and assembly is handled by the non-profit Commercial Support Services of Contra Costa County, employing the developmentally disabled.